In a small deep bowl, or plastic bag, mix maple syrup and soy sauce. Arrrange fillets so that marinae completely covers fish. Marinate in the refrigerator for a long as possible (a minimum of 4 hours). Rub oil on a 10x10 inch sheet of aluminum foil. Bake on the top rack of the oven for 7 minutes. (Syrup may cause fish to smoke, but not to worry) Salmon can also be grilled. Dont even think about using microwave. Avoid overcooking the fillets. 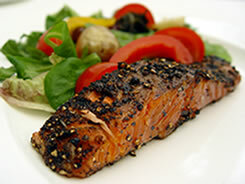 Salmon is best when the color has turned to a pale pink, but the fish is still moist throughout. Serve immediately on warmed plates.